March 15, 2017 - Like us now! 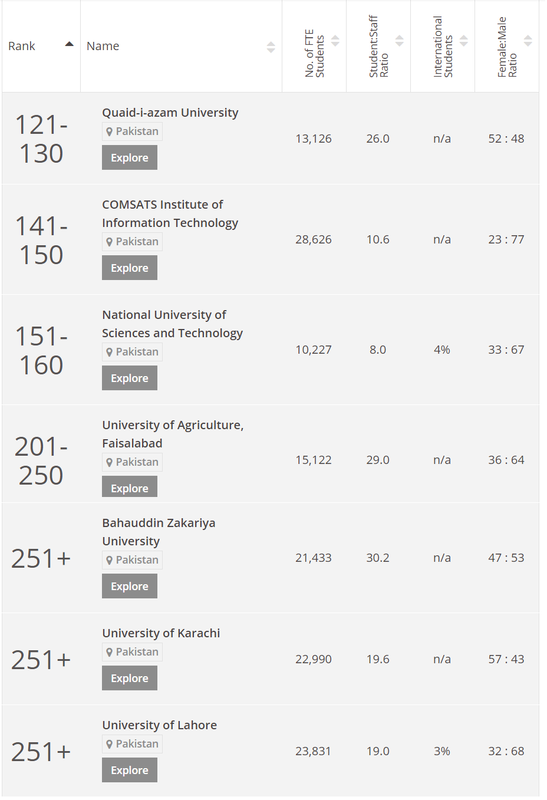 The Times Higher Education list of the latest Asia University Rankings 2017 includes seven Pakistani institutions in the top 300, up from only two institutions in 2016. The Times Higher Education World University Rankings, founded in 2004, provide the definitive list of the world’s best universities, evaluated on the basis of teaching, research, international outlook, reputation and more. The data are trusted by governments and universities and are a vital resource for students, helping them choose where to study. In 2016, only Quaid-e-Azam University (QAU) and National University of Science and Technology (NUST) made it to the list of Asia University Rankings. This year, Pakistan has tripled its representation in the list of Asia’s best universities, with seven Pakistani institutions in the top 300. Because of increased competition, many new institutions have entered Asia’s rankings which now includes 300 universities, up from 200 last year. Singapore’s National University and China’s Peking University have been ranked first and second respectively. In South Asia region, India took 33 places in the tables this year, more than double its representation a year ago. You can check the World Rankings, Region Rankings and Country-wise rankings here.